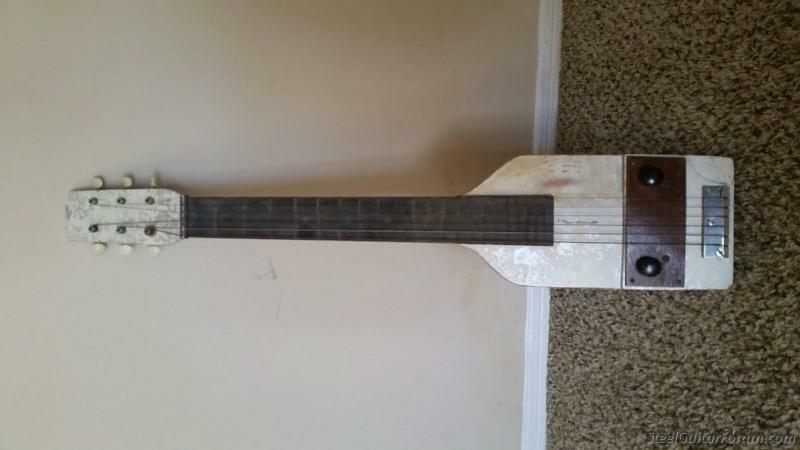 Can anyone identify this vintage lap steel? 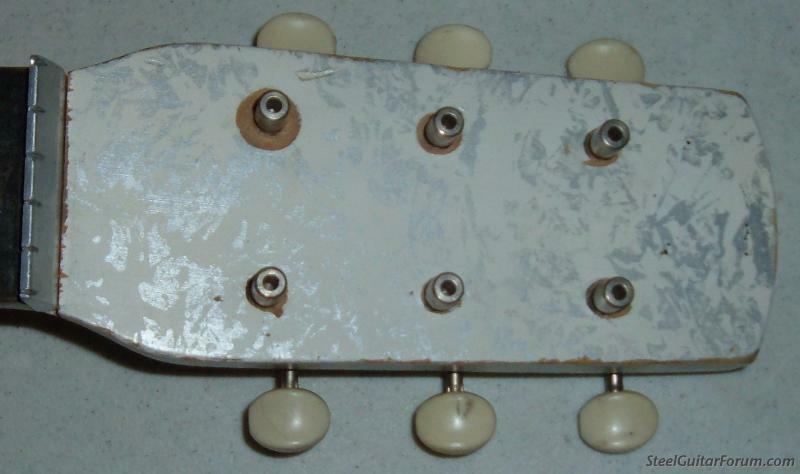 Topic: Can anyone identify this vintage lap steel? Hard to tell from the picture, but my wild guess would be somebody's home build. It reminds me a bit of my old National Chicagoan in general shape, but the Valco vibe ends there, since, if I recall correctly, they pretty much all had pickups. Is there a pickup hidden under that plate with the knobs? And is that a nut riser at the nut? Isn't that MOTS? Did guys experiment with that stuff at home? I thought that was just a factory type finish? Sorry guys, I can't answer any of your questions. All I have is the photo, which raises more questions than answers. It piqued my interest to the point I submitted a bid approximately equivalent to the cost of a couple of six-packs of Three Barrel Trashy Blond. Surprisingly, I won the auction. After it's delivered I will snap some pix and report back. Good score, Jack! Just for the fun of it. Looking forward to some more pics. It's definitely not a Valco product. I can't say who did build it, but it's not a manufacturer that I'm familiar with. Thanks for chiming in, Noah. I thought if anyone would recognize it, it would be you. Don't think it's a homebuilt. It has a similar finish to the Epitome lap steels that were distributed by Jackson Guldan of Columbus, Ohio. Instead of the gold paint underlying the white, like on the Epitome, this one has silver paint underneath. The pickup appears nearly identical to a prewar Gibson P-13. 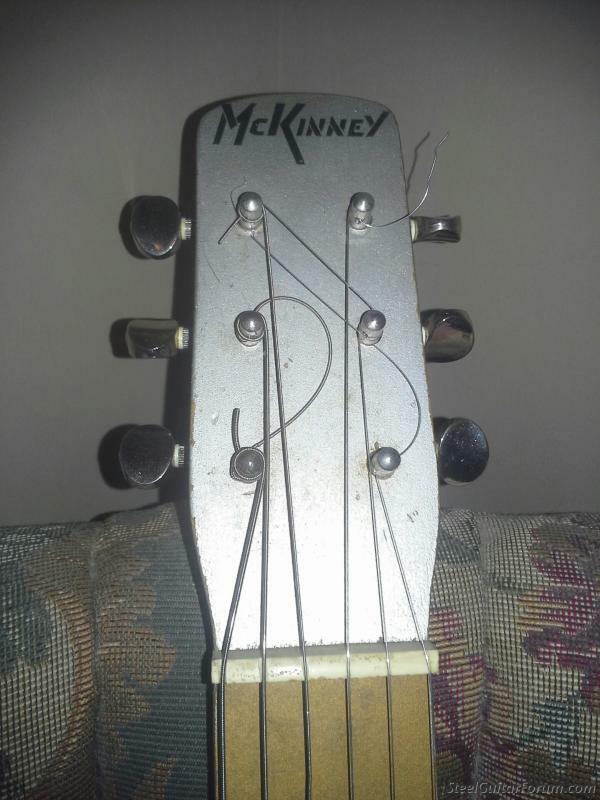 There are remnants of a decal on the headstock that has long since flaked off. The pickup/control mounting plate was a chunk of 1/4" plywood paneling, so I fabricated a new one from Stew-Mac b/w/b/w/b pickguard material. 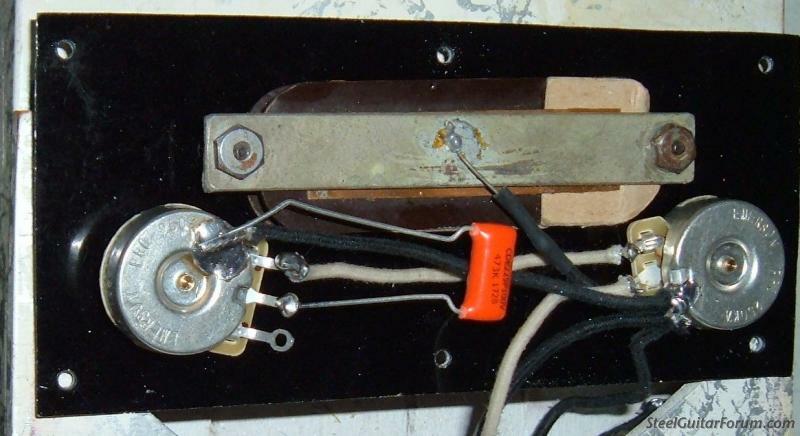 The tone pot was frozen solid, so I replaced all the electronics (with the exception of the pickup) with top quality components. The bridge was mounted about 1/2" too far from the nut, so I repositioned it properly. Pleased to report that it plays fine and it sounds great. Unless someone makes me an offer I can't refuse, it'll be headed to the local music store for consignment on my next trip to town. 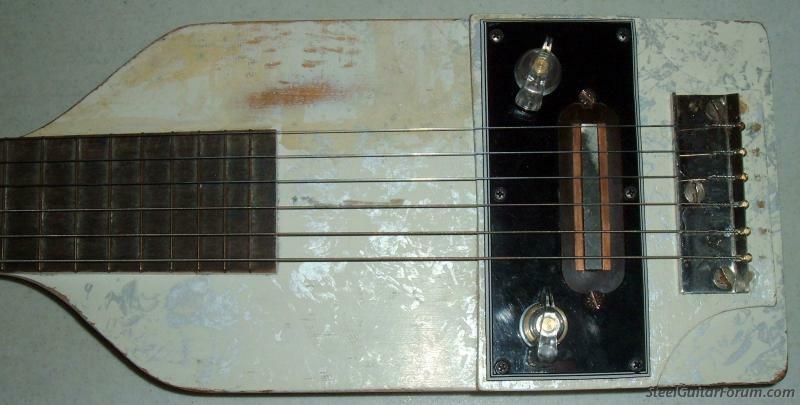 In some ways it looks like a McKinney lap steel I have. A lot of those old steels had similar characteristics though. I like the clear chicken head knobs. I've not seen those before. I decided to save the original brown Bakelite knobs for an upcoming project. I purchased the clear chickenhead knobs from Antique Electronics in Arizona a few years back and I agree that they look pretty cool for this application. 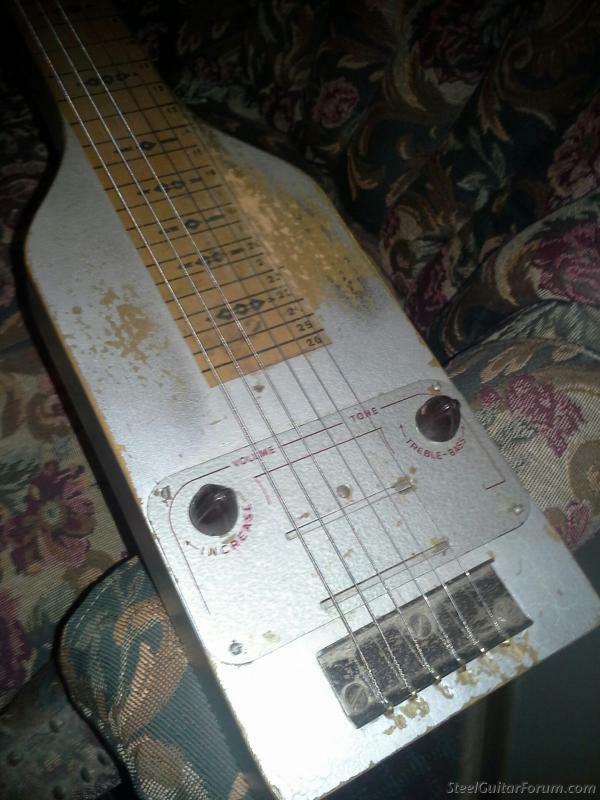 This is a McKinney lap steel I have. 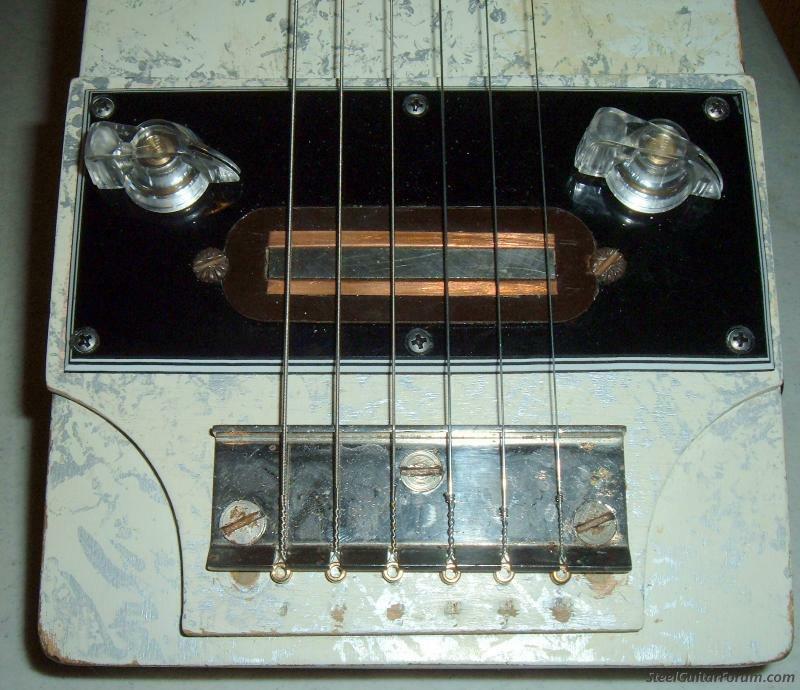 To me the body style and bridge closely resemble that of your lap steel. Also the placement of the volume and tone knob seem to be in the same position. I've done research on mine and not come up with much about them. I agree that the body shapes of both instruments are quite similar, and the bridges appear identical. I've seen several McKinneys that were obviously produced by Valco, but agree with Noah that these two were not. I have a Kay that looks similar. I believe the mounting plate on Daniel's guitar may be the key to identifying these instruments. Mine has oddball tuner strips. 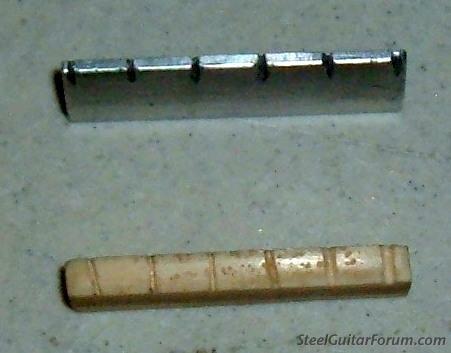 There is a hole through the top that is somewhat "J"-shaped down through the shaft to emerge on only one side. They're Klusons, but unlike any I've seen before. I can see why they never caught on, as it must have taken two hours to install an .024p in the third position. Definitely not a Kay either. I think you were probably right that it's a Guldan. 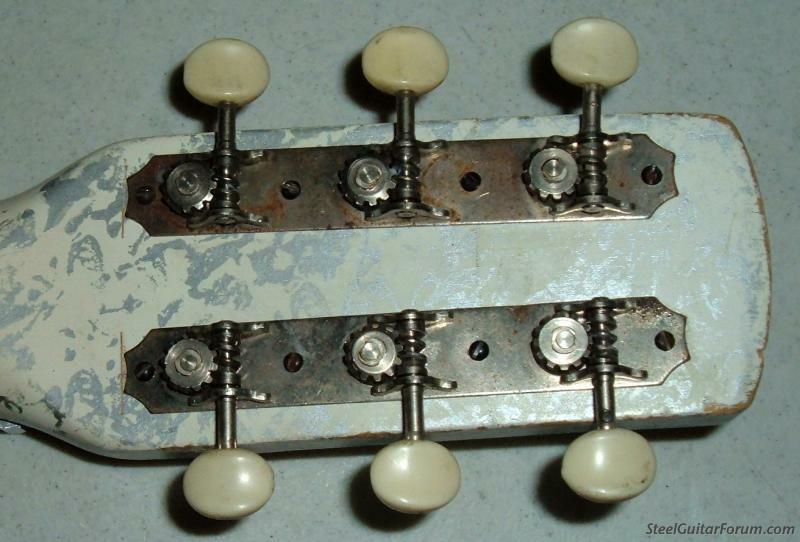 Here is the headstock on mine. It has the same type of nut yours had. Mine no longer has the original tuning keys.